Main features of the ToughPad FZ-B2 Intel Celeron N2930 quad-core processor, 7-inch display and replaceable battery. Panasonic has introduced a new rugged tablet called – ToughPad FZ-B2. Running Android 4.4 KitKLat, the new Panasonic is powered by an Intel Celeron N2930 quad-core processor with a clock speed of 1.83GHz, along with 2GB RAM. The Panasonic ToughPad FZ-B2 has a 7-inch display 1,280×800 touchscreen with an anti-reflection layer. The tablet has 5MP rear camera and 2MP front snapper. The tablet comes with 3GB of storage. Panasonic hasn't revealed battery capacity but claims it will deliver up to 7 hours of back up on charge. The Panasonic has a replaceable battery. For connectivity, the ToughPad FZ-B2 supports Wi-Fi 802.11ac, Bluetooth 4.0, USB 3.0, microSD, and a microSIM slot. The tablet is capable to perform in temperatures ranging from -10 to 50 degrees Celsius. At the recently held MWC 2014, Panasonic had introduced two new rugged “tablets with phone functions” – FZ-E1 and FZ-X1. While the Panasonic Toughpad FZ-E1 runs Windows Embedded 8 Handheld, the Toughpad FZ-X1 runs Android 4.2.2 Jelly Bean. Both the devices have 5-inch display, quad-core processor and LTE connectivity. Back in India, the company has launched a quad-core smartphone called T40. Priced at Rs. 5990, the new Panasonic T40 supports dual-SIM, runs Android 4.4 KitKat and is powered by a 1.3GHz quad-core processor with 1GB of RAM. 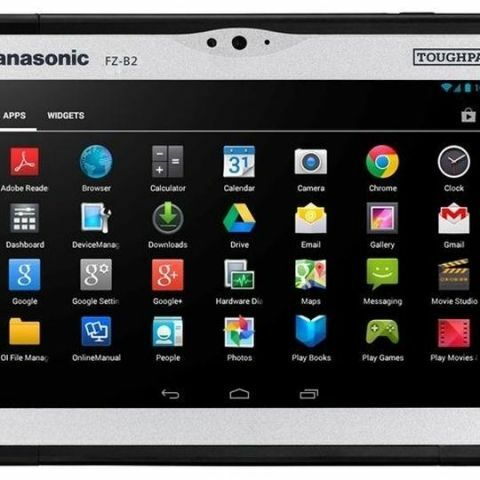 The Panasonic Toughpad FZ-B2 will be available in Europe for a starting price of 591 Euros.